Nellie and the girls forage under a bush. They say this is much better than time in the coop. Just as Matt and I got a routine down with the chickens, we decided it might be nice to get away for a long weekend. The biggest dilemma wasn’t where to go, or what to pack. We needed to find a chicken sitter! Unlike a dog, we couldn’t board the chickens, or drop them off at a buddy’s house. Honestly, the task seemed daunting. 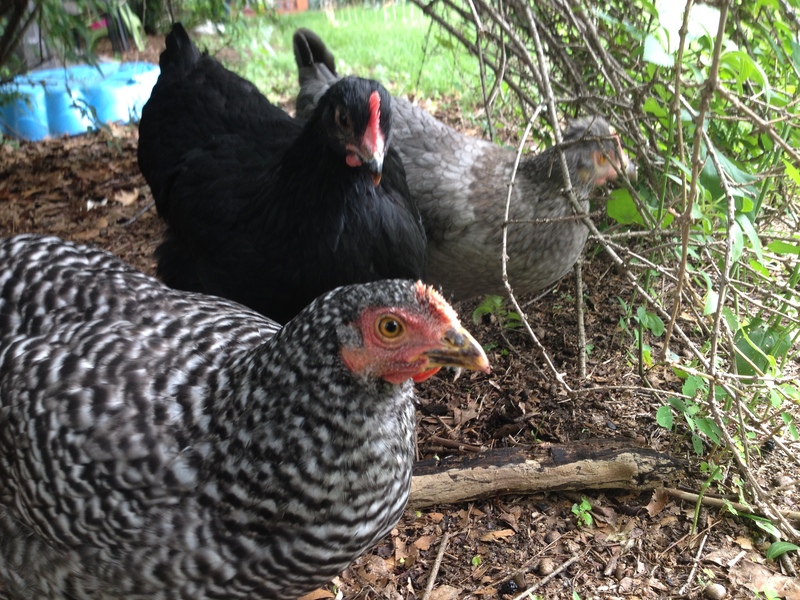 We needed someone who would come over at 6:30 a.m. to let the chickens out and put their food in the coop, then return at dusk to close the little chicken coop door and to put the food away. To me this all felt like a lot. Even though I had the duties each down to an impressive 4 minutes when I put my mind to it, somehow it felt like a lot to ask of a friend. Then about a week before we went on our trip, a neighbor stopped by to chew the fat. She and her husband had shown a great interest in our coop while we were building it, and in our chickens once they arrived. The chickens fluttered around our feet as we chatted. Then I went in for the kill. “Would you be interested in watching our chickens while we take a long weekend? I’ll pay you,” I offered. I then apologetically explained about letting them out at the crack down dawn, and returning at dusk. I told her I would love to help her out. And that was that. We had a chicken sitter. Last Saturday, Matt and I drove up to Goderich, Ontario, and reveled in our free time. That night, I received a text message from my neighbor letting me know the girls were all tucked into the coop. The second night, she messaged asking if she should shut the coop windows overnight. I had forgot to tell her about that in my tutorial. I told her to leave them open. 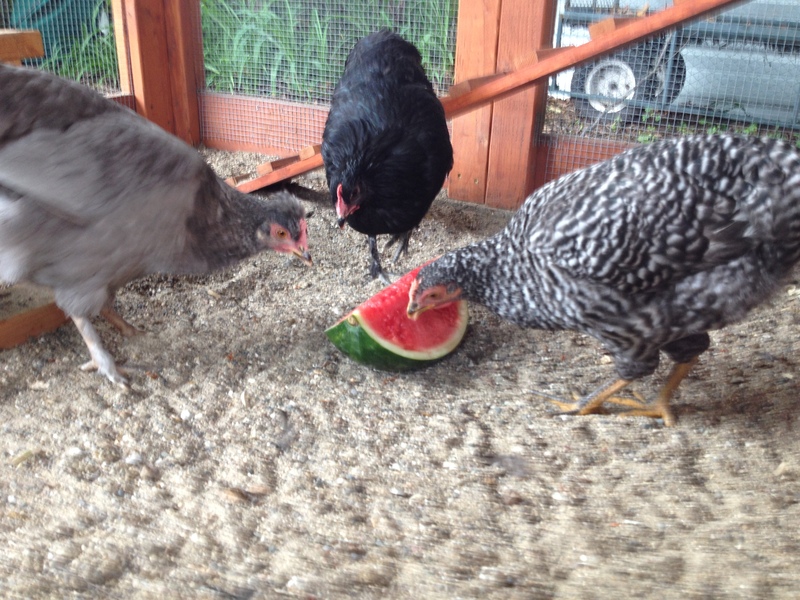 The girls enjoy a welcome-home watermelon. Monday afternoon, as soon as we got home, Matt and I walked straight back into the yard to check on the girls. They chirped, cooed and even howled when they saw us. It was quite a reception! I gave the girls a piece of leftover watermelon, and watched them chomp away. I wondered if they even realized I was gone. Then I celebrated our short getaway. When we got chickens, I worried if we would ever find anyone who would be able to handle the demands of chicken sitting. It truly was a great unknown. But with the help of a great friend and neighbor, I can breathe a little easier. My birds were cared for, and my neighbors’ yard will be greatly tended to. ← Week 13: Geez, it’s hot! That’s good you found a neighbor. I’m hoping for the same for mine.